Their first decade of play, however, was marked by futility; they finished in last place in the AL East in all but the 2004 season, when they finished second-to-last. Following the 2007 season, Stuart Sternberg, who had purchased controlling interest in the team from Vince Naimoli two years earlier, changed the team's name from "Devil Rays" to "Rays", now meant to primarily refer to a burst of sunshine rather than a manta ray, though a manta ray logo remains on the uniform sleeves. The 2008 season saw the Tampa Bay Rays post their first winning season, their first AL East championship, and their first pennant (defeating the rival Boston Red Sox in the ALCS), though they lost to the Philadelphia Phillies in that year's World Series. Since then, the Rays have played in the postseason in 2010, 2011, and 2013. The Tampa Bay Rays' chief rivals are the Boston Red Sox and the New York Yankees. Regarding the former, there have been several notable on-field incidents. The Rays also have an intrastate interleague rivalry with the National League (NL)'s Miami Marlins (originally the Florida Marlins), whom they play in the Citrus Series. Lou Piniella served as manager of the Devil Rays from 2003–2005. Local leaders made many unsuccessful attempts to acquire a major league baseball team in the 1980s and 1990s. The Minnesota Twins, San Francisco Giants, Chicago White Sox, Texas Rangers, and Seattle Mariners all considered moving to either Tampa or St. Petersburg before deciding to remain in their current locations. The Florida Suncoast Dome (now named Tropicana Field) was built in St. Petersburg in 1990 with the purpose of luring a major league team. That same year two separate groups, one in Tampa and another in Sarasota, were seeking to get an expansion team. The Tampa one even registered the name "Florida Panthers", after a local feline - a trademark which ended up being purchased by entrepreneur Wayne Huizenga one year later, and used by him to name an NHL ice hockey team. When Major League Baseball announced that it would add two expansion teams for the 1993 season, it was widely assumed that one of the teams would be placed in the Dome. However, in addition to the application from St. Petersburg, a competing group applied to field a team in Tampa, prompting much conflict over the bid. The two National League teams were awarded to Denver (Colorado Rockies) and Miami (Florida Marlins) instead. These statistics are current through the 2018 Major League Baseball season. As a fellow member of the AL East division, the Yankees and Rays play many times each season. There has always been some feeling of a rivalry between the teams because the Yankees make Tampa their spring training, as well as having a minor league team in the Tampa Tarpons; home and fan loyalty in the Tampa Bay area has historically been divided, especially among transplants from the northeastern U.S. The rivalry became more heated in spring training of 2008, when a home plate collision between Rays outfielder Elliot Johnson and Yankees catcher Francisco Cervelli was followed the next day by spikes-high slide by Yankees outfielder Shelley Duncan into Rays' second baseman Akinori Iwamura, prompting Rays outfielder Jonny Gomes to charge in from his position in right field and knock Duncan to the ground. The Rays also have a geographical rivalry with the Miami Marlins. Tampa Bay currently leads the series, 57–56. The Rays have played at Tropicana Field since their inception in 1998. The facility, which was originally called the "Florida Suncoast Dome", was built in the late 1980s to attract an MLB team through either relocation or expansion. After St. Petersburg was awarded an expansion franchise in 1995, the dome underwent extensive renovations and naming rights were sold to Tropicana Products, which was based in nearby Bradenton. In October 2014, Sternberg, frustrated with efforts to build a new stadium in the Tampa Bay area, had discussions with Wall Street associates about moving the Rays to Montreal, which has been without a Major League Baseball franchise since the Montreal Expos moved to Washington, D.C. in 2005 to become the Washington Nationals. On December 9, 2014, reports surfaced that owner Stuart Sternberg will sell the team if a new stadium is not built. On February 9, 2018, the team said that Ybor City is their preferred site for a new stadium. However, at the December 2018 Winter Meetings in Las Vegas, Sternberg announced that plans for the proposed stadium in Ybor fell through, meaning the Rays were still on track to play at Tropicana Field until 2027. Later in December 2018, the team sent a letter to St. Petersburg's mayor, Rick Kriseman, foregoing an extension to search for a new stadium outside of the city. Rays' current road uniform, Alex Torres pitching. 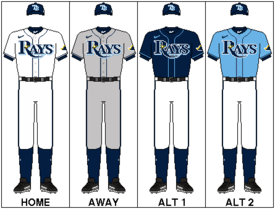 The current Rays primary uniform has been used with little change since the team officially shortened its name from "Devil Rays" to "Rays" for the 2008 season. The home jersey is a traditional white with the name "Rays" in dark blue across the chest and a yellow "sunburst" on the letter "R". The Rays' road uniform is gray, also with a sunburst and the team name across the chest. Both feature dark blue piping and caps featuring a white "TB" logo. 2005-07 road uniform, Rocco Baldelli running. During their first three seasons, the Devil Rays wore traditional white home and gray road uniforms with the text "Devil Rays" (home) and "Tampa Bay" (road) in an unconventional multicolor "rainbow" across the chest. The inaugural caps were also unusual: black with a purple brim at home and all black on the road, with both versions featuring a devil ray graphic and no letters at all. The caps changed in 1999 to feature a smaller ray and the letters "TB" and were all-black for both home and road games. During the 1999 and 2000 seasons, the Devil Rays added an alternate black jersey featuring the same rainbow text as the white and gray uniforms. In 2005, the home uniforms were again tweaked to include still more green. The primary home whites became a sleeveless jersey worn with green sleeved undershirts, and the primary home caps were changed from black to green. In addition, a small ray with a long tail was added under the name "Rays" on the chest of the home jerseys. The Rays' opponent on Turn Back the Clock night also wears throwbacks from the same era as the Rays' retro uniforms. For example, the Houston Astros wore their 1980s "Rainbow Guts" uniforms, the New York Mets wore the road uniforms of their 1969 championship team, the Chicago White Sox wore their red and white home uniforms from the 1970s, and the Baltimore Orioles wore their rare all-orange uniforms from the early 1970s. Perhaps the most memorable such game was on June 23, 2007, when the Devil Rays wore St. Pete Saints uniforms from the early 1950s, and the Los Angeles Dodgers wore the gray road uniforms of the World Series-winning 1955 Brooklyn Dodgers to honor Don Zimmer, who played on that Dodger team and was a senior adviser for the Rays prior to his death. Rays management also gave away a bobblehead at the game featuring a young Zimmer in a Dodgers uniform and an older Zimmer in a Devil Rays uniform. Dewayne Staats (play-by-play) and former MLB pitcher Brian Anderson (color commentary) are the TV voices of the Rays. For the first 11 seasons of the franchise, Staats teamed with former MLB pitcher Joe Magrane on the Rays' TV broadcasts. Magrane departed after conclusion of the 2008 season to take a position at the MLB Network. Former minors catcher and MLB manager Kevin Kennedy then served as the primary color commentator in 2009 and 2010, with Brian Anderson filling in on some road trips, after which Anderson took over as the everyday commentator from 2011. Staats, Magrane, Wills, Olden and Slowes have all been nominated for the Ford C. Frick Award, the broadcasters' path to the Baseball Hall of Fame. The Tampa Bay Devil Rays were featured in the movie, The Rookie, a 2002 drama directed by John Lee Hancock. It is based on the true story of pitcher Jim Morris, who had a brief but famous Major League Baseball career with the team. Morris was a 35-year-old high school baseball coach who could repeatedly throw a baseball 98 miles per hour (158 km/h), an ability that only a few major leaguers could equal at the time. He was persuaded to try out for professional ballclubs and signed with the Tampa Bay Devil Rays organization. Morris was initially assigned to the minor league Class AA Orlando Rays (now the Montgomery Biscuits), but quickly moved up to the AAA Durham Bulls and was called up to the "Bigs" during the September 1999 roster expansions. 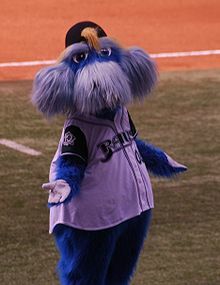 Jim Morris spent parts of two seasons with the Tampa Bay Devil Rays as a reliever, pitching 15 innings in 21 games, with an earned run average of 4.80 and no decisions. During the playoffs, Rays players and coaches sport mohawk haircuts. The trend started during their 2008 World Series run. 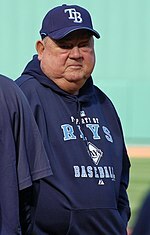 Don Zimmer had his #66 retired by the Rays. Statistics below are through the end of the 2017 season. ^ a b "Time to shine: Rays introduce new name, new icon, new team colors and new uniforms". RaysBaseball.com (Press release). MLB Advanced Media. November 8, 2007. Archived from the original on November 11, 2007. Retrieved February 8, 2018. ^ Chastain, Bill (February 7, 2018). "Rays set to celebrate 20th anniversary in '18". RaysBaseball.com. MLB Advanced Media. Retrieved February 8, 2018. Prominent among those items was the 20th anniversary logo that will appear on the left sleeve of all Rays 2018 regular-season jerseys and caps. The home-plate shaped patch features the number 20, a sunburst and a variation of the original fish -- all in the Rays' modern colors. ^ "Rays All-Time Uniforms and Logos". RaysBaseball.com. MLB Advanced Media. Retrieved February 11, 2019. ^ "Tampa Bay Rays Team History & Encyclopedia". Baseball-Reference.com. ^ "Devil Rays' ownership transfer approved". ESPN. Associated Press. November 17, 2005. Retrieved September 12, 2017. ^ Reuter, Joel (June 11, 2013). "Is Red Sox-Rays the Most Underrated Heated Rivalry in Baseball?". Bleacher Report. Retrieved September 12, 2017. ^ "HOW ABOUT PANTHERS?". Orlando Sentinel. April 13, 1990. Retrieved September 12, 2017. ^ Giuliotti, Ed (April 1, 1991). "Local Fans Give Huizenga 113,000 Votes Of Confidence". Sun-Sentinel. Retrieved September 12, 2017. ^ Joseph, Dave (June 15, 1993). "Panthers Unveil Uniforms, Logo". Orlando Sentinel. Retrieved September 12, 2017. ^ Chass, Murray (November 11, 1992). "BASEBALL; Look What Wind Blew Back: Baseball's Giants". The New York Times. Retrieved September 12, 2017. ^ a b "Tampa Bay Rays History & Encyclopedia". Baseball-Reference.com. Retrieved September 28, 2008. ^ "Most Valuable Player MVP Awards & Cy Young Awards Winners". Baseball-Reference.com. Retrieved November 14, 2018. ^ Ryan, Bob (October 19, 2008). "Tampa Bay steps up as new rival". The Boston Globe. Retrieved September 12, 2017. ^ Topkin, Marc (October 9, 2008). "Rays-Red Sox rivalry dates to 2000". Tampa Bay Times. Retrieved September 12, 2017. ^ Cafardo, Nick (April 27, 2005). "Schilling and Piniella exchange barbs". The Boston Globe. Retrieved September 12, 2017. ^ Romano, John (October 9, 2008). "Message pitch in Boston helped carry Rays' season". Tampa Bay Times. Retrieved September 12, 2017. ^ Cristodero, Damian (March 7, 2005). "Rays: Fans as scarce as wins". St. Petersburg Times. Archived from the original on December 27, 2017. Retrieved September 12, 2017. ^ "mcubed.net : MLB : Series records : Miami Marlins against Tampa Bay Rays". Retrieved September 30, 2014. ^ Sharockman, Aaron; Nohlgren, Stephen (September 5, 2008). "Why replace the Trop?". Tampa Bay Times. Retrieved September 12, 2017. ^ Williams, Pete (November 28, 2007). "Rays unveil plans for new stadium". Major League Baseball Advanced Media. Retrieved September 12, 2017. ^ Gonzalez, Alden (May 22, 2009). "St. Pete waterfront ballpark a no-go". Major League Baseball Advanced Media. Retrieved September 12, 2017. ^ Nohlgren, Stephen (March 16, 2010). "ABC Coalition make its Tampa Bay Rays stadium pitch to Pinellas County". Tampa Bay Times. Retrieved September 12, 2017. ^ Madden, Bill (October 25, 2014). "MLB commish Bud Selig's nightmare is Cubs dream as Joe Maddon leaves Rays". New York Daily News. Retrieved September 12, 2017. ^ "Report: Rays owner discussed move to Montreal". TSN. October 26, 2014. Retrieved September 12, 2017. ^ "Tampa Bay Rays owner Stuart Sternberg said he will sell team if new stadium not built". Sports Illustrated. December 9, 2014. Retrieved September 12, 2017. ^ Topkin, Marc (December 11, 2018). "Rays say current Ybor stadium project is dead, remain committed to Tampa Bay area – for now". Tampa Bay Times. Times Publishing Company. Retrieved December 12, 2018. ^ Lacques, Gabe (December 11, 2018). "Rays' new stadium proposal dead – and clock ticking on alternatives to Tropicana Field". USA Today. Gannett Company. Retrieved December 12, 2018. ^ Frago, Charlie; Soloman, Josh (December 18, 2018). "It's official: Tampa Bay Rays tell St. Petersburg they are finished looking elsewhere, for now". Tampa Bay Times. Times Publishing Company. Retrieved December 20, 2018. ^ "Rays to St. Pete: Finished looking elsewhere, for now". ESPN. December 19, 2018. Retrieved December 20, 2018. ^ "National Baseball Hall of Fame - Dressed to the Nines - Uniform Database". exhibits.baseballhalloffame.org. ^ a b "Q&A: Tampa Bay Rays wear variety of throwback uniforms". Tampa Bay Times. ^ "Rays Turn Back the Clock with a fake throwback jersey". Tampa Bay Times. June 30, 2012. Retrieved January 27, 2013. ^ Rays' throwback uniforms to a time when they didn't exist. Content.usatoday.com (2012-06-20). Retrieved on 2013-07-23. ^ "Lots of fun at the ballpark". Ocala Star-Banner. Retrieved August 1, 2017. ^ "Rays will turn back the clock Aug. 13 with Village People". Tampa Bay Times. ^ "Rays celebrate Turn Back the Clock Night; Zimmer bobblehead, former Dodgers mates featured at Rays-Dodgers game". Tampa Bay Rays. Archived from the original on March 10, 2012. ^ Anthony Mccarron (November 29, 2009). "Paul Olden, public address announcer at Yankee Stadium, gets nod from 'Voice of God' Bob Sheppard". New York: NYDailyNews. ^ Maury Brown. "Long Rays Forecast: FSN Florida Signs 8-Year Extension with Tampa Bay". bizofbaseball.com. ^ FOX. "Tampa Bay news, weather forecast, radar, and sports from WTVT-TV - FOX 13 News - FOX 13 Tampa Bay". FOX13news. ^ Virginia Johnson (October 7, 2010). "DJ Kitty is the Tampa Bay Rays best kept secret". Bay News 9. Retrieved October 7, 2010. ^ "Notes: Gomes enjoys Wrestling Night". Tampa Bay Rays. ^ "'Wrestling Night' returns to The Trop". Tampa Bay Rays. ^ "Mohawk fever spreading among Rays". Major League Baseball. Retrieved June 5, 2016. ^ "Maddon uses 9=8 slogan to motivate". Tampa Bay Rays. ^ "Rays clinch club's first playoff spot". Tampa Bay Rays. ^ Marc Topkin (February 26, 2010). "Season slogan: WIN". St. Petersburg Times. Retrieved February 26, 2010. ^ John Romano (May 7, 2010). "Rays' mantra: GTMI". St. Petersburg Times. Retrieved June 22, 2010. ^ "Cot's Baseball Contracts: Tampa Bay Rays". mlbcontracts.blogspot.com. ^ "Tampa Bay Rays Salaries". USA Today. June 18, 2016. ^ Topkin, Marc (March 27, 2019). "Rays 2019 salaries: The $52 million men". Tampa Bay Times. Tampabay.com. Retrieved March 27, 2019. ^ Topkin, Marc (March 28, 2018). "Rays salaries: The $67.5 million men". Tampa Bay Times. Tampabay.com. Retrieved September 30, 2018.